Tulsa Event Professionals presents “The Bridal Experience,” a full day of informational sessions taught by some of Tulsa’s elite wedding industry vendors. The sessions will contain question and answer panels, how-to tips, and live demonstrations revolving around that special day. Topics like getting the most from your photography, selecting entertainment, choosing a venue, and serving your guests at the reception will help brides-to-be navigate planning their big day. The event will also feature “Date Night” prize drawings from various popular restaurants around town. Vicki Taylor, producer of The Tulsa Wedding Show, will also be on-hand to answer questions on how to get the most out of a wedding show. Anyone wishing to attend can sign up online for the sessions they want to attend to reserve their spot. Reservations are not necessary but they are suggested. “Guests can come, get the information they’re after, and go home. The best part is that this event is entirely free,” says Jesse Reich, owner of Jesse Reich Photography and Tulsa Photobooth. “Brides have tons of questions that they are afraid to ask. Now they have a place to go to ask those questions,” says Kena Lundy, co-owner of Edge Sight & Sound and Party AllStars. This unique event serves to educate anyone planning a wedding and will arm any bride and groom, or parents of the bride, with the knowledge to plan a spectacular wedding and spend their money smarter. “Brides and grooms just want information. The more information they have, the better they feel about their investment in their wedding,” says Meghan Hurley, owner of Concepts PR Events & Design. 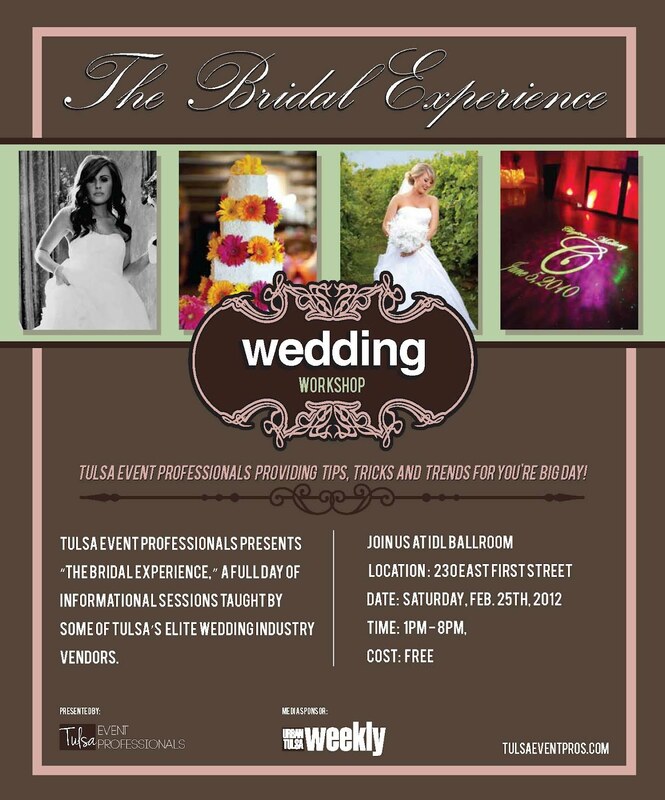 “The Bridal Experience” will be hosted at IDL Ballroom on Saturday, February 25, 2012 from 1PM-7PM. The event is free to the public, but online registration is strongly encouraged. For more information or to view the event schedule, please visit www.tulsaeventpros.com. Tulsa Event Professionals is an organization that will provide free informational and educational workshops on weddings and events featuring area vendors. TEP strives to keep area brides and event hosts in the know regarding latest trends, fashion, and vendor information. For more information on TEP, please visit www.tulsaeventpros.com. Ipod, Band, or DJ: What’s Best For My Reception? Entertainment Director and Event Planner: What is the Difference and How Do They Benefit Me?